Death in the Memorial Garden Give-Away Winner! So You Think You Know Vintage Mysteries? Last year I had several folks either discover this reading challenge late in the game or who enjoyed it so much that they asked me to host again. Just this week I've had requests from the color fans asking for another round. 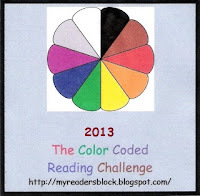 So, for your challenge reading pleasure, I will once again host The Color Coded Reading Challenge beginning January 2013. Since this is my third year in, I've loosened the categories up a bit--I will now accept any shade of the required colors. 1. A book with "Blue" or any shade of Blue (Turquoise, Aquamarine, Navy, etc) in the title. 2. A book with "Red" or any shade of Red (Scarlet, Crimson, Burgandy, etc) in the title. 3. A book with "Yellow" or any shade of Yellow (Gold, Lemon, Maize, etc.) in the title. 4. A book with "Green" or any shade of Green (Emerald, Lime, Jade, etc) in the title. 5. A book with "Brown" or any shade of Brown (Tan, Chocolate, Beige, etc) in the title. 6. A book with "Black" or any shade of Black (Jet, Ebony, Charcoal, etc) in the title. 7. A book with "White" or any shade of White (Ivory, Eggshell, Cream, etc) in the title. * Any book read from January 1 through December 31, 2013 will count. *Everyone who completes all nine categories will be entered in a year-end drawing for a book-related prize package. *Please post about the challenge on your blog. Sign ups accepted until Nov 30, 2013. Thanks for hosting again, Bev! I appreciate that you have loosened up the categories. I didn't do so well with this year's challenge, but I'm hoping for success next year! So, would "gray" fit into the Black category? I'm with Darlene on this one...didn't do so well this year! I'm looking forward to 2013 and may be able to actually finish with the loosened up categories! Darlene: I'll take gray as a shade of black. This is going to be awesome!~ Thanks for hosting! I have signed up for three challenges for 2013 so far and they are all hosted by you. I am looking forward to all of them. Star, glad to have you! TracyK, thanks so much for joining me in all my Challenge Madness! I'm excited to try some challenges this year, and this one looks like so much fun. I'm all linked up and made my list... which was a lot harder than I would have thought. Thanks for hosting! I have a question. Can I pick a book that has a color in its title but not in English? For example, can I pick a book titled "Merah" (Bahasa Indonesia), which means "Red"? Biondy: Most certainly. Color names are not limited to English. I think I have a book assigned for each color, though I'm sure a few will change through out the year. Great challenge, I'm joining for the first time and I'm looking forward to it. Thanks for hosting! Hi, I want to do this one, too, and have added my link. Will "chocolate" count as a shade of black? And can "ink" be used for the "word that implies color" ? Thank you so much for hosting this. This will be first year doing any reading challenges, but I'm looking forward to making a dent in the number of books on my Kindle. (Of course if I would just stop downloading new ones, I'd probably have a better chance of succeeding!!) I had a reading day yesterday, in between company, and finished my "Blue" book last night, so I'm off to a great start!! Do graphic novels count or must the books be prose only? Because I read GNs too, and I don't know if they count. Dovile: If it's a book--it counts. Go for the Graphic novels! I'm joining a little late, but I guess I've subconsciously been preparing for this challenge. I already have five categories complete! I'm looking forward to finding books to fit the last four.